Ancient Magic, the first story in the Urban Fantasy series, Relic Guardians is available for pre-order at the introductory price of just 99c. 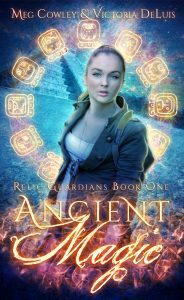 In Ancient Magic, you will meet Zoe Stark as she journeys to the jungles of Mexico to recover a lost Mayan artefact that could wreak death and devastation across the world. Can she discover who the true enemy is in time to save the fabled Kukulkan Skull from being used for great evil? Could Zoe be the skulls first victim? Grab Ancient Magic, and Step into the Ley Line World to find out!